Cost: One ticket is included in the Full Congress Registration. Additional guest tickets can be purchased for $75.00 inclusive of GST each. Please indicate your intention to attend when registering for the Congress. Cost:	Tickets $125.00 per person with a Full or Day Congress Registration. Additional guest tickets can be purchased for $155.00 inclusive of GST each. Please indicate your intention to attend when registering for the Congress. Jake Bailey is an 18 year old ex-Christchurch Boys' High School senior monitor. 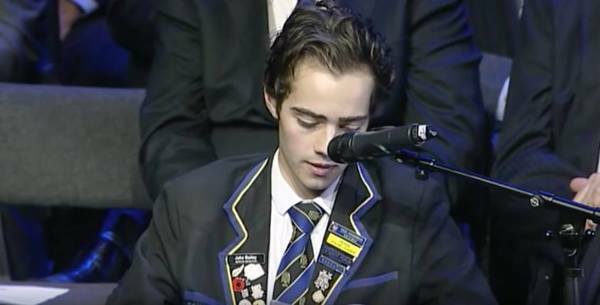 His prize-giving speech made worldwide headlines after going viral in November 2015. A week before he was due to deliver this speech he fell ill and was diagnosed with Burkitts non-Hodgkinson lymphoma, the fastest growing cancer known to man, and was given three weeks to live if left untreated. He persevered through this challenge to make his speech to his fellow students. The video clip of his speech went on to touch the hearts of millions across the globe. He was the "clear winner" of Massey University's 2015 New Zealand Quote of the Year after receiving an unprecedented 77 per cent of the public vote. Since being announced in remission in January, Jake has gone on to share with audiences his experiences, his courage and the things he has learned that have given him clarity throughout his journey, in the hopes of helping other young people facing difficulties.